"Copy of Plat by O. J. Chapman - Eaton Cemetery - 1st Burial - Mary Constable - by her Son-in-Law - Wilson Martin"
"East part Bought of Chas. 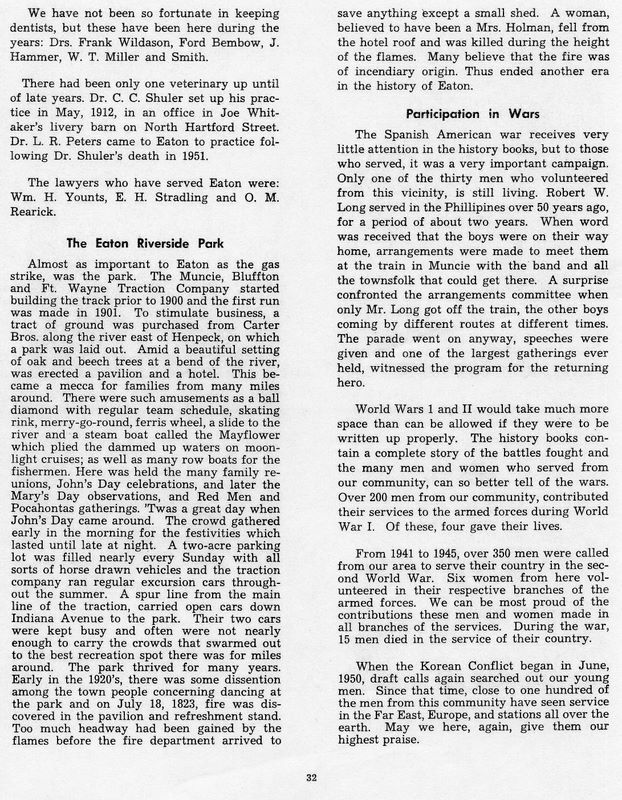 Carter - West Part Bought of James Long, Surveyor"
"Delaware Co. History - Page 291 - By Will Brandt/ March 4, 1928"
"Parade of the Johns at Eaton"
"Eaton, Ind., Aug. 18. -- The above is a picture of the bands and Johns forming in parade for John's Day, which marched from East Harris Street to riverside Park. The parade was headed by the Gaston band, followed by the Johns on foot, then the Eaton band and gaily decorated carriages and automobiles, in which the Johns too old to make the trip on foot were taken." S2 Kemper, G.W.H., M.D., ed. A Twentieth Century History of Delaware County Indiana, 1908; reprint ed., Evansville, Indiana: Whippoorwill Publications, 1984. Bk3012. S3 Baker, J. David. The Postal History of Indiana, Vol. 2 . Louisville, Ky: Leonard H. Hartman, 1976, Bk3010. S6 Baker, J. David. The Postal History of Indiana, Microfiche . Louisville, Ky: Leonard H. Hartman, 1976, Bk3010. S7 Map of Delaware County, Indiana. Compiled by H. Lester Janney. Revised by Ward M. Harlan, 1965. S8 An Atlas of Delaware County, Indiana . Philadelphia: Griffing, Gordon & Co, 1887, reprint ed., Knightstown, Indiana: Mayhill Publications, 1971, Bk1849. S9 United States Official Postal Guide . Boston: H.O. Houghton and Company, April 1875, Bk1548. S10 Bracken Library Special Collections. Ball State University. Map #61-2. 1. I have a ribbon [flag] from this event. It is blue felt with gold lettering. It is in the shape of a triangle flag measuring 3.25" on the end and 5-7/8" on each side. 2. Text: "3rd Annual Bill's Day Aug 26 1914 Riverside Park Eaton Indiana"
S18 Kemper, G W H. A Twentieth Century History of Delaware County Indiana. Chicago: Lewis Publishing Co, 1908. Bk3012.